Shopworker Richard Ellery, 21, was on a rare trip to the capital on the morning of 7 July. The employee of the Ipswich branch of camera chain Jessops had just been swapped from part-time to full-time work and was making his way to a training course at the firm's Kensington store. He had intended to get up at 0600 BST to catch his train to London but "true to form" did not awake until 0630 BST and had to rush to the station. In a text to his mother at 0830 BST he said he was en route, as his train reached Liverpool Street station. But Richard never arrived at the course and his parents, who live in Southampton, and his flatmate tried to contact him when they saw the news. His father Trevor travelled to London the following day with the family's local vicar, carrying a picture of his son in an effort to track him down. Richard Ellery's younger brother Tim, 19, and his Ipswich flatmate, Tom Stopani, also made the trip to help. Confirmation of his death on the Aldgate-bound Tube train came several days later. At the inquest, a firefighter said Mr Ellery was able to give his name as he arrived at the scene but died before medics reached the carriage. 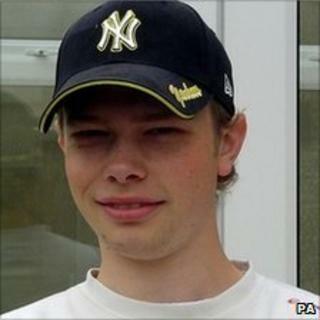 A statement from the family at the time said: "Richard was a fun-loving boy - full of enthusiasm for life. "He will be sorely missed by all of his family and close friends." Mr Ellery was born in the Shirley area of Southampton on 19 April 1984, the oldest of three brothers. He attended Wordsworth Infants School, Shirley Junior School, Bellemoor secondary school and Tauntons College. Mr Ellery was a big music fan and had a saying that he "didn't like to listen to music, he liked to hear it". After leaving school at 18, he found jobs in retail, at a mortgage company office and in the building industry. He was once keen to become a plasterer and worked on the family house when it was improved in 2003. In March 2005, he left the family home to move in with two school friends in Ipswich and found work at Jessops. He enjoyed his new job and used to return to his flatmates enthusing about the latest gadgets. In a letter to the inquest, Mr Ellery's father said his son had "grown into a confident and very sociable man" and "had been beginning a new and very positive phase in his life". His new employer closed all its 280 stores for the national two-minute silence on 14 July 2005. The manager of the Ipswich branch, David Gunn, said Richard had become a very popular member of staff in the five weeks he had been working there. In his police statement, Mr Stopani said: "Richard also had a knack of making you feel better just by talking to him. You would go to him with a moan or a gripe and come away feeling so much better, but Richard would just say he had done nothing."